This week for Freebie Friday I am going to highlight a tutorial recently published by Mary Corbet over on Needle n’ Thread. 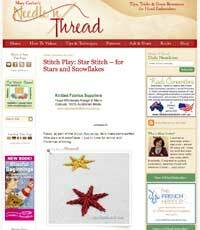 Mary has introduced her readers to a variety of Star Stitch that can be used to represent stars and snowflakes. Go, take a look. Next she extended the tutorial to include patterning and different shaped stars. You will find the second tutorial here. The tutorial is part of Mary’s stitch play series and of course it is very timely as this stitch can be used easily on Christmas Decorations and gifts. Friday freebies is a regular series in which I highlight free resources online, free patterns and links that are of interest to fiber folks. All posts in the series are in the Friday Freebie category I hope you enjoy them.